New year, New goals, same old me, and I like it that way. I think the expression “New Year, New You”, has good intentions, I get the importance of self improvement and setting goals, I’m game, I even set some goals of my own this year, but I much prefer the idea of loving the person that I am and learning to accept my human-ess and imperfections rather than creating a new me. That’s not to say I don’t think we should strive to be and do more. Accepting and loving yourself the way you are is not about complacency and resistance, it’s about showing yourself the same compassion you show others, cutting yourself some slack and giving yourself a chance to grow, evolve, and blossom without the pressure of unrealistic expectations and ridiculously high standards. Growth happens when you learn to love and accept yourself, so go ahead, give a little love, do a little dance, the result will be a more fabulous and brilliant YOU, and isn’t that point? In the spirit of acceptance, I’m here to declare that as much as I strive to eat a healthy whole food diet, I do love a good plate of pasta once in a while, and let’s face it, avoiding pasta in Italy is like self inflicted torture, which I’m not into personally, so I will accept it for what it is. Since I moved to Italy, I’ve learned the best pasta sauce making tricks from the pros. No one does it better than the Italians, they can create a mean sauce out of anything and there are more pasta shape and vegetable combinations and permutations than I can dream about. 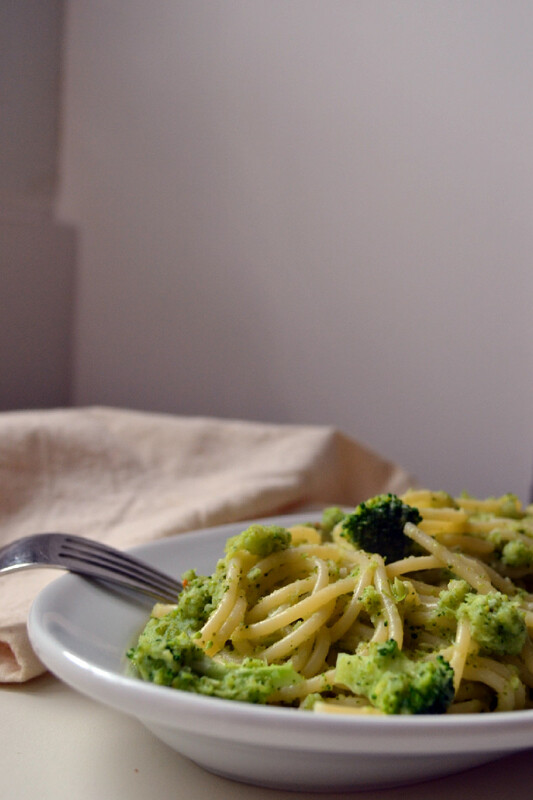 One of our favourites is this Broccoli Pasta, that’s both delicious and packs a lot of nutrition. There are various ways to make it, but most of them involve overcooking the pasta. Italians love cooking their vegetables to a mush. I much prefer my veggies with a bite, so I’ve come up with my own variation. Broccoli gets sauteed with onions and garlic and a pinch of sea salt and pepperoncino (spicy red pepper flakes), then pureed using a bit of the starchy pasta cooking water which softens and emulsifies it into a sauce without the need for oil and/or creamer, then it gets tossed with some crisp florets and pasta noodles. You can use your favourite pasta shape, and while I’ve used spaghetti here, this does go better with fusilli which traps the sauce in the crevices of the spirals. You can go gluten free or not. I usually use DeCecco Organic Kamut Pasta (not gluten free) or Quinua Real Organic Brown Rice and Quinoa Pasta (gluten free). They both hold up their shape and texture nicely and don’t get starchy and clumpy like I’ve seen other kamut or gluten free pastas do. Broccoli, the most beloved and loathed vegetable of all time also happens to be one of the healthiest of them all. Packed with many nutrients, broccoli is best known to have anti-carcinogenic properties and to protect cells from free radical damage. This cruciferous vegetable is rich in vitamins (C, A, and K) and minerals (calcium, phosphorous, magnesium and iron) and is best lightly steamed, with a little crunch, both from a flavour and nutrition stand point. Eventhough pasta is a carbohydrate, it doesn’t necessarily make it bad for you. Our bodies need carbohydrates for energy, which is a topic that probably deserves a post of its own. I do however recommend that you chose from a wide variety of alternatives to the refined white flour pasta including but not limited to whole wheat, multi-grain, spelt, kamut and the gluten free brown rice or quinoa. They are generally higher in fiber and protein content than refined white pasta and will keep you satiated longer and if you toss it in a killer nutrient dense vegetable like I did here, then you can feel great about having your pasta and eating it to. 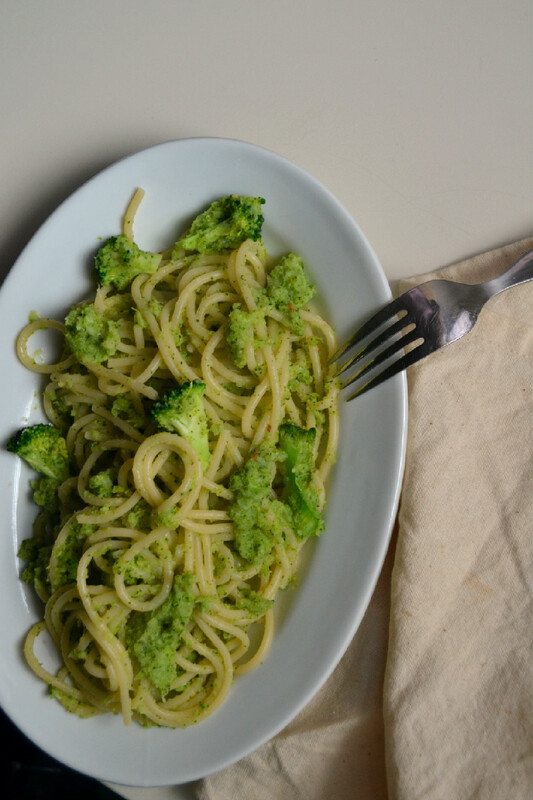 Broccoli is sauteed with onion, garlic and pepperoncino and reduced to make the perfect accompaniment to your pasta for a delicious and nutritious take on this beloved Italian favourite. For an oil free option, use water or vegetable broth to sautee the vegetables. For a gluten free option, chose gluten free pasta such as brown rice, buckwheat or quinoa. Sautee onion in EVOO, water or broth and a pinch of fine sea salt until translucent. Add garlic and sautee 2-3 minutes. Add broccoli, cut into small florets, reserving a handful for garnish. Stir to coat with the oil, garlic and onion mixture, add an inch of water, cover and let simmer for 5-7 minutes until broccoli is tender. Meanwhile, cook the pasta in boiling salted water according to package directions for al dente (slightly undercooked with some bite). 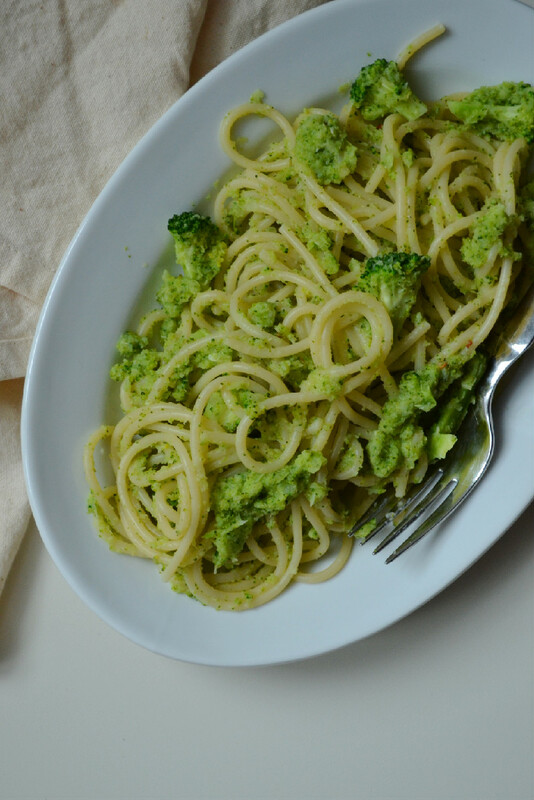 Just before straining the pasta, add a ladle of the pasta cooking water to the broccoli mixture and puree using a hand blender, or transfer everything to a stand blender and pulse for 30 seconds or until you’ve achieved the desired consistency. Add the puree back to the pan, add reserved broccoli florets and heat through on medium heat until the florets are tender, but still crisp about 3 minutes. Add another small ladle of pasta cooking water to liquify the sauce if necessary, but don’t add to much or overcook it as you don’t want the broccoli to brown and lose its nutrients. 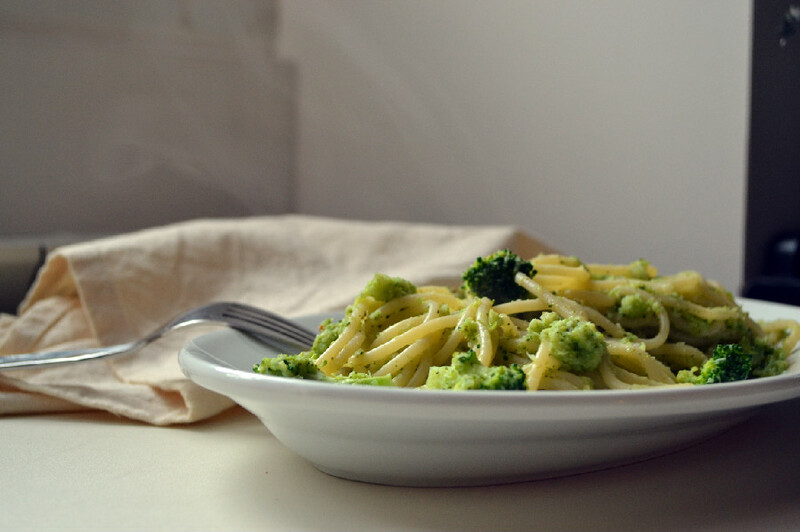 Strain the pasta, toss it in the broccoli mixture until heated through about 1 minute and serve immediately.